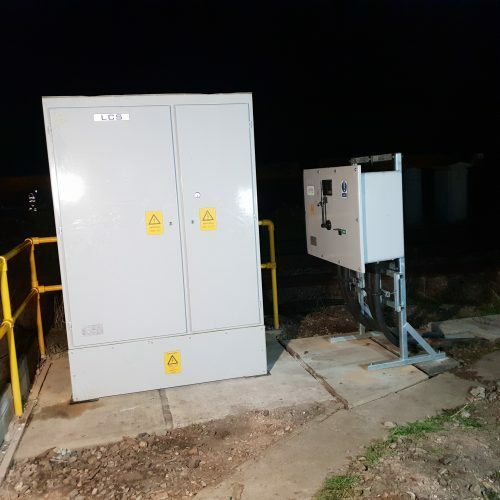 RJ Power Rail have successfully delivered their first Controlled Track Switch (CTS) at Woking. As part of a design change, the CTS was now replacing a previously installed Track Disconnector Switch. This would provide future safe isolation, as personnel would not have to attend the site to undertake the physical isolation. The existing concrete base had to be modified to accommodate the new CTS Unit and the team also installed GRP handrail, to make it safe for operatives in the event of the CTS having to be operated manually. The delivery of the CTS Unit was carried out within a 3hr night possession using an RRV. These works form part of a contract awarded in March 18 for the design and installation of 30 Control Track Switches in the Wessex Area. A contract for which RJ Power Rail are providing a fully managed D&C service.